This is the shocking moment a sports car overtakes a learner driver and then loses control on a wet road. 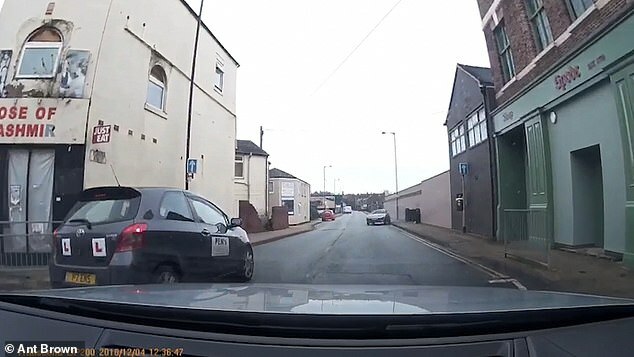 Dash cam footage captured the moment when the silver Mazda MX5 accelerates past a dark Toyota carrying L-plates in Stoke-on-Trent, Staffordshire, after being stuck behind it for some time. The silver sport car spins out of control and its boot smacks into a cable box on Elenora Road after shooting round the bend of Liverpool Road. The Mazda comes to halt having done a 180-degree spin before a man is seen sprinting across the road to help its driver. A witness said the driver – a man in his sixties – was unhurt, except for his ‘pride’. The incident happened on Tuesday at around 12:40pm. Ant Brown, 44, a key account manager from Birmingham recorded the incident on his dash cam. Ant added: ‘Luckily no one was hurt – apart from someone’s pride and Stoke’s internet connection!! Ant said that up until that point the driver of the Mazda had been relatively patient but then got ‘a bit carried away with the acceleration’. The 44-year-old said: ‘I went to check on him after pulling over and surprised to see a 60+ gent driving and looking a bit embarrassed. ‘He wanted to go but both tyres were blown, so I stopped the traffic for him to turn round and park up. Ant said the learner driver, a young woman, pulled up after the crash was ‘very shook up’ by the incident.